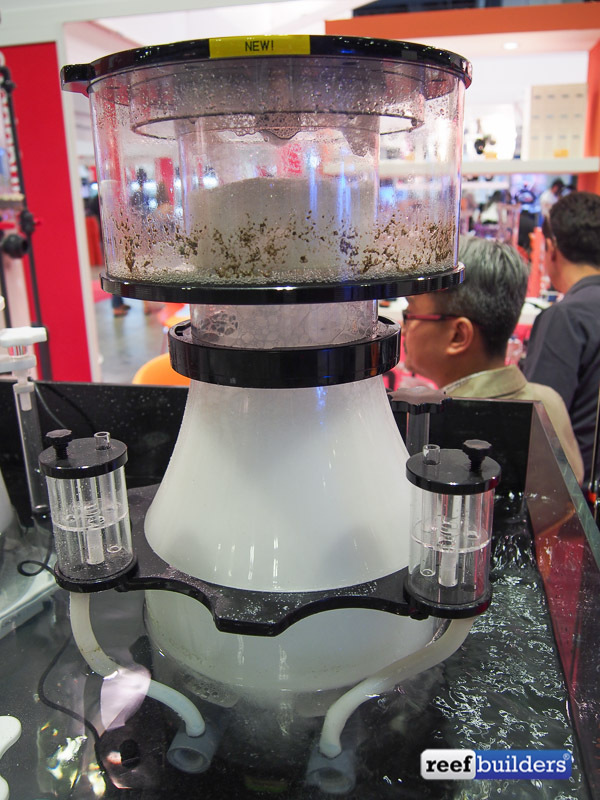 The Skimz Octo protein skimmers are the annual new-skimmer introduction for the venerable Singaporean brand. The Skimz Octo are generally the same as the Skimz Monzter protein skimmer, with a semi-cone body, a full bubble plate diffuser, bayonette fitting removable neck and skimmer cup, but it does offer some very real refinements. Most notable for the Skimz Octo protein skimmer, is the use of the Messner needle wheel powerhead pump, the first and only such protein skimmer to use them. Messner is best known for producing high performing water pumps for pond applications with large motors in Germany. In a strange reversal of trends, while some German skimmers are using Chinese pumps, the Skimz Octo is the first Chinese/Singaporean skimmer to use a German water pump. The Messner pumps, like any good German-made aquarium device, are a highly refined AC motor aquarium water pump with extremely tight tolerances. Just looking at the Messner pumps you can tell that they are not cheaply made, with much thicker plastic and epoxy resin potting to the internals, and the advanced design gives the Messner pumps a very high efficiency with very low noise. The Messner needle wheel pumps are particularly well suited to protein skimmer applications as they spin at high RPMs creating a very fine air-water mixture which is evident to see in the operation of the dual pump Skimz Octo protein skimmer pictured below. Other improvements to the Skimz Octo protein skimmers is a new, dual-chambered air silencer which is now fully serviceable, and further reduces noise. Skimz will be offering the new Skimz Octo line of German-powered protein skimmers in four sizes, and they should become available in the U.S. through Bulk Reef Supply when the skimmers are in full production.